After no-one showed up to the Septemberfest celebration, Watson wondered what he was going to do with all the leftover party decorations. Sam finally understood how his childhood parrot managed to live so long. Each and every parrot blew its brains out on his front lawn. All the man had asked was: "Does any one of you want to be my friend?" I'll pick a winner later on tonight, if anyone wants to try and get some last second captions in! So many great entries! It was hard enough to narrow it down to this as it is! Wow. I actually re-watched the film just to see if that line directly preceded that shot... and it did. Major props. I didn't think the guns would come into play. 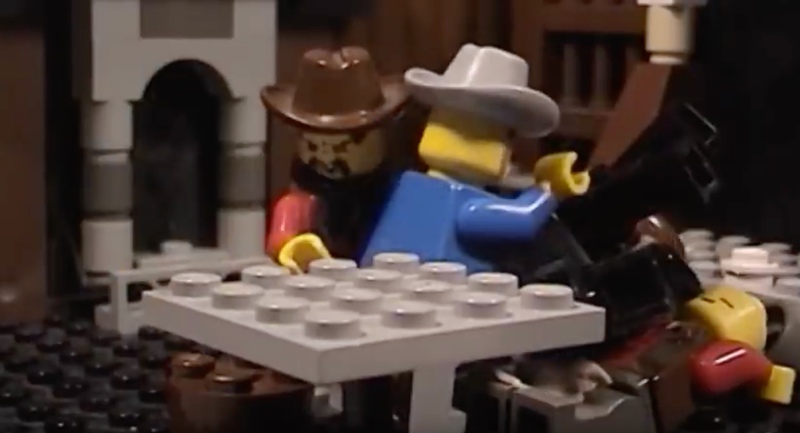 But, you definitely surprised me, legogod. It's all yours. Bring in October with a bang, no pun intended. Thanks. Here's the next picture. I'll post the winner on Sunday. Ok? Rule 101 Section 2 Paragraph B of the Rule Book of Life: Always defend your doughnuts! 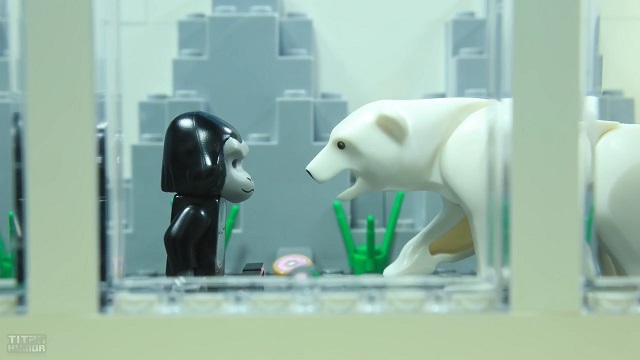 "Aren't you a little short for a..."
Here we see the rare mating ritual of the gorilla and the polar bear. What a fierce combination. It became clear very quickly that it was going to take much more than drywall and fiberglass to keep the animals in the appropriate exhibits. How about we both eat the pastry? You eat it first and I'll eat you. Let's go crack the case! I heard that the steel panels were on back order at Amazon. Nice one. This one is funny and has a nice poetic quality to it. I imagine a country singer strumming and crooning about that movie he just saw. You know the one..."War for the Rise..."
Take it away Dragon Brick. I find the most restful sleep is when there's a pile of bar room cowboys having a brawl on top of me. Isn't it relaxing? "Hey, this is my table!"